In a stunning reversal, Secretary of State Jim Condos on Wednesday threw out results from last week's Progressive primary for governor after discovering a series of "human errors" in vote counting. "In the rush to complete the August 28th primary canvassing report over the long holiday weekend, human errors were made in the calculation of write-in votes for the Progressive Gubernatorial race," Condos (pictured) said in a statement. 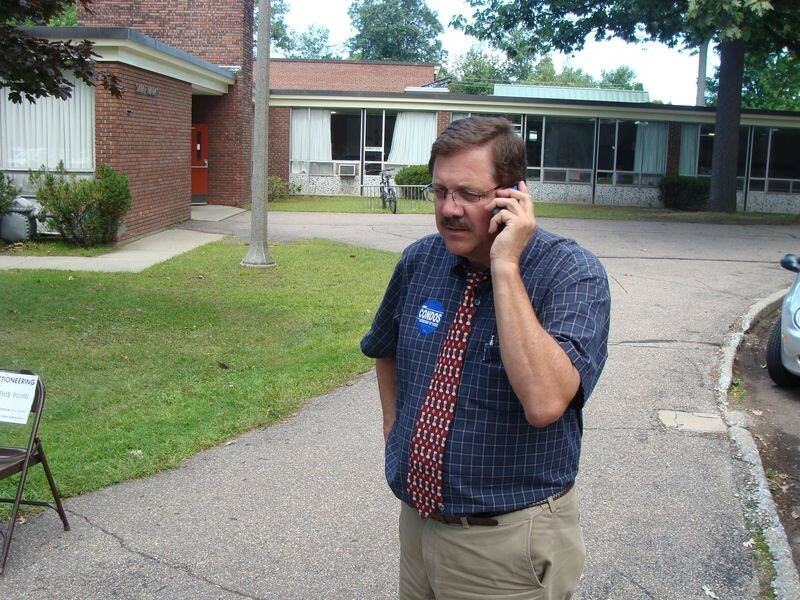 Election officials in Hardwick and Walden apparently miscalculated tallies. As a result, write-in candidate Annette Smith now trails declared winner Martha Abbott by just a single vote out of 735 ballots cast — not the 17-vote margin Condos had certified earlier this week. Condos hastily scheduled a meeting of the Primary Canvassing Committee for Thursday afternoon in Montpelier to re-certify corrected results. "As I grew up, my father always told me that if a mistake is made, own up to it, learn from it and move on!" Condos said in a statement. The new outcome puts Smith well within the 2 percent margin for requesting a recount — and on Wednesday, Smith told Seven Days she would request a statewide recount. "I hope I can do it tomorrow," Smith said. "I think it's in everyone's best interest to ensure the integrity of our election process." Smith runs the advocacy group Vermonters for a Clean Environment and is perhaps the loudest voice against big wind-power projects in the state. The Danby resident did not put herself up as a candidate. Rather, big-wind opponents organized the write-in campaign in the hope of drafting Smith to take on pro-wind Gov. Peter Shumlin in the fall election. Abbott, the Vermont Progressive Party chair, declared victory on Tuesday after Condos certified her the winner. As promised, she promptly declined the nomination — saying Shumlin was sufficiently committed to the Prog agenda. Her withdrawal meant that unless Smith prevails in a recount, the Democratic governor won't have a Progressive opponent for the second election running. "After talking with Progressives throughout the state, it is clear that most want to stay out of the governor's race this year," Abbott said in a statement Tuesday. "Governor Shumlin has shown that he is fully committed to implementing a single payer health care plan and to closing Vermont Yankee, priorities which Progressives have worked on for decades. It is important that Shumlin receive large majorities in the election to demonstrate the political will of Vermonters to continue to put these policies in place." Condos said that Stephanie Kaplan, an attorney who helped organize the draft-Smith campaign, was in his office reviewing primary results and questioned some of them. "Something didn't look right," Condos said. Kaplan said she knew of at least eight people in one town that had written Smith's name in but who didn't show up in the canvass report. "So we called and sure enough there was a mistake," Condos said. In one town, Condos said there were seven additional votes for Smith that were not included in the certified total. In another town, there were nine uncounted votes for Smith. Condos would not name the towns, but sources identified them as Walden and Hardwick, respectively. Results in three other districts were questioned but none had votes for Smith, Condos said. In the Hardwick mix-up, Condos said his staff apparently misread a faxed copy of the election results. "If you look at the original, it looks like it was a zero and someone added a leg to it," he said, meaning the actual number was nine. "This is an anomaly," Condos said. "Generally, write-in situations are not going to be a problem. In this particular case it was." Until Wednesday, Smith hadn't said whether she was even a candidate — stressing that entering a political race could jeopardize her group's nonprofit status. On Wednesday, Smith said "I am now a candidate" but added, "My only role as a candidate is to get a recount so we have a fair election result." "If the results show me the winner, then I have to grapple with my role as ED of VCE and as a candidate for gubernatorial office," Smith said. "I don't have to do that if the results come out and I am a loser." And if the recount shows her the winner, will she run? "I'm not going to speculate. Don't ask me to speculate," she said. "After we get results, if I am not the winner, end of story. I don't have to grapple with anything. If I am the winner, then I have to grapple with these roles. Do I quit my job? I don't know."